I am Alina and this is my 4-week yoga teacher training diary series, which I want to share with you over the next month. Having practiced Yoga for 5 years I decided to dive even deeper into the powerful world of Asanas and join a RYT 200 TT with Routes of Yoga. Find out everything about the amazing progress I made, the doubts I had, and emotions that came up during class — I put it all in this diary for you! The program offers a 200-hour Yoga Alliance certified training lead by Anton Jager and Daphne Charles. It focuses on teaching the common routes of Yoga. Learning about where all those yoga styles come from and what they have in common is a great advantage and gives a great foundation. 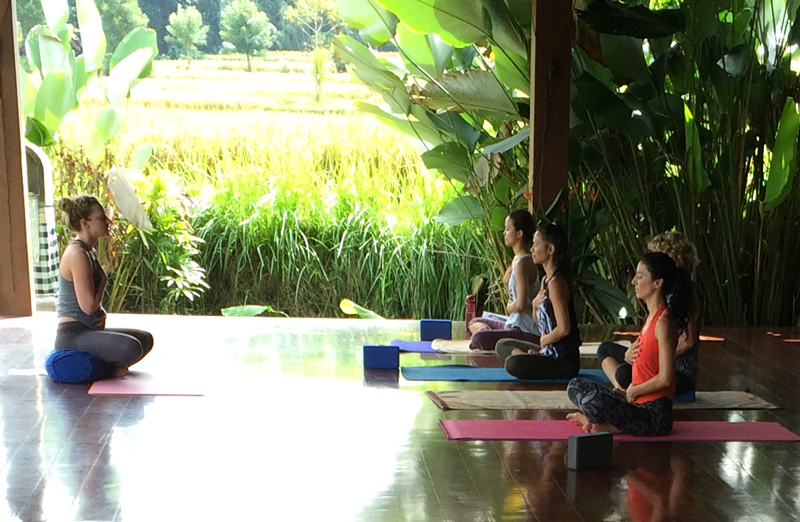 Beautiful location in Ubud, Bali with a retreat-style program. The program covers all major styles of yoga in both practice and theory and follows a very structured schedule. Every participant gets a comprehensive teacher training course manual / workbook. Reasonably priced – Great value for money. I loved the friendly e-mails with Anton and Daphne prior to my booking. 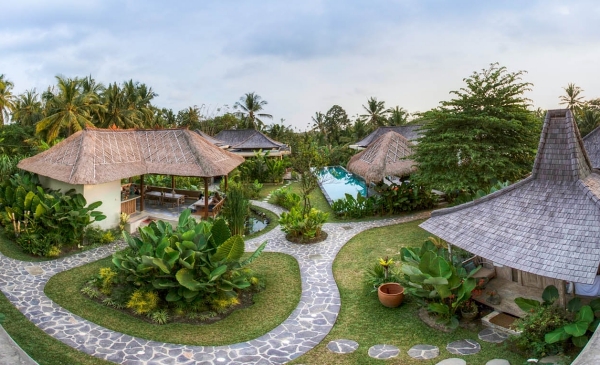 The location of this yoga teacher training is just amazing: Spa treatments, a salt water pool, and Balinese-style accommodation surrounded by palm trees and lush rice terraces. After a 5-minute drive through lush rice fields, I arrive at The Shala — my temporary home for the next intense 23 days. The Shala lies beautifully surrounded by palm trees and the friendly staff welcomes me with a zingy ginger drink. We all meet for the first time in “our” Shala, a well-equipped yoga room overlooking rice fields and palm trees, where we are heartily welcomed by our teachers, Daphne and Anton. They introduce us to the program and lay out the next 4 weeks. The training program is very well-structured. It includes lectures, workshops, and teaching sessions, building on to each other and making it easy for us to follow and understand. Right after the welcome, we start straight away with a nice-flowing Vinyasa practice. Can't wait for more! Our schedule is tight – starting at 7 a.m with a 90-120 minute class, followed by a one-hour breakfast break to enjoy at the Shala Café. Fresh fruit salads and a large variety of other options - heaven! The first week sets the foundations for each of the modules, History, Asanas, Anatomy. Learning how to teach comes later in the course so that we have time to simmer and digest these concepts in for ourselves. In theory class, we talked about the transition of asana towards meditation and the mind. We absolutely needed to learn this because as teachers, we should be able to make students understand the connection of physical postures and mindfulness. I love finding out about what unites all yoga styles and their common route — So interesting! We are a diverse group, with ages varying from 21-60 and coming from different countries including Russia, USA, Germany, Singapore. In our first partner exercise we got together in pairs. We led each other through the room, by only just touching palms. This made me realize that you can connect with a person you hardly know, even without sharing a word. A beautiful experience. Building Strength: "Work Towards Your Borders"
We often forget that it's way more important to do the poses with modifications and right alignment, than push to achieve the full expression with the risk of strain and injury. Later on that day after our first Yin yoga class with Daphne, we shared our experiences as the sun went down and we instinctively calmed down. We then spoiled ourselves with a traditional Balinese massage. Highly recommended! During the first Asana Workshop, we learned about poses in great detail. After that, we practiced those poses to experience, observe, and learn how to sequence them in different styles: Hatha, Vinyasa, or calming Yin Yoga. 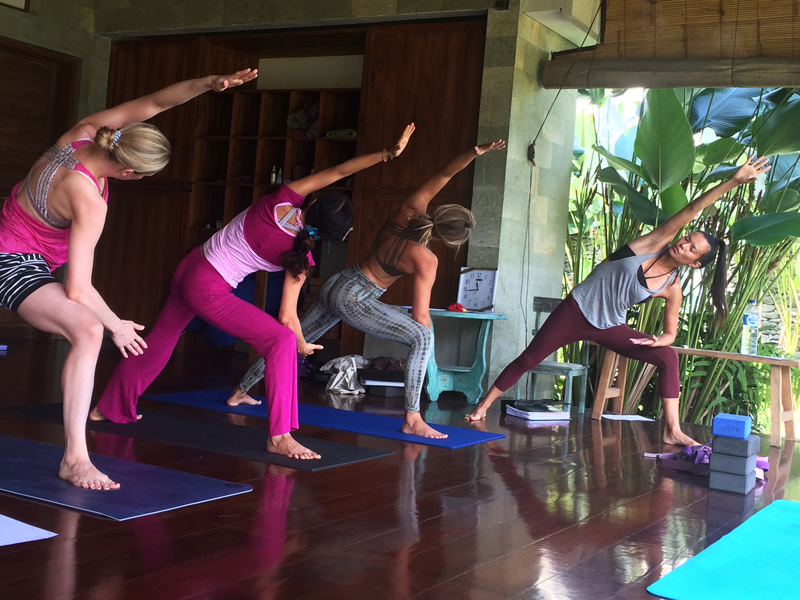 In the Asana Lab, we discussed how being a good teacher doesn't mean you have to be able to perform all poses. It’s necessary to observe your students, know the body, and learn the principles of Asanas. It's encouraging to realize that it can be a good thing if you have trouble doing certain poses at first because then you'll already know the steps and cues that help, and you can teach that to your students. At that moment though, I felt so far away from teaching. It's overwhelming to think about how I'll be able to teach a proper class in only three weeks! But I keep my focus and continue on, taking things one step at a time. You can literally feel that the training program is thought through because of how it builds up every day. I love it! For this week's last activity, Daphne guides us through a Mantra chanting practice. It gets tough to keep up (my mouth was getting dry), but it's definitely worth the sensation — you can feel the sound vibrations in your body and an intense feeling of connectedness within the group. Tomorrow is our first day off. I am looking forward to enjoy the beautiful surroundings and to sleeping in of course :). Stay tuned as I share the following 3 weeks: what we learned, how we practiced, and the fun we had together!